Soccer Physics, by Otto Ojala. My Recommendation: Good for a quick laugh, but it has little lasting enjoyment. 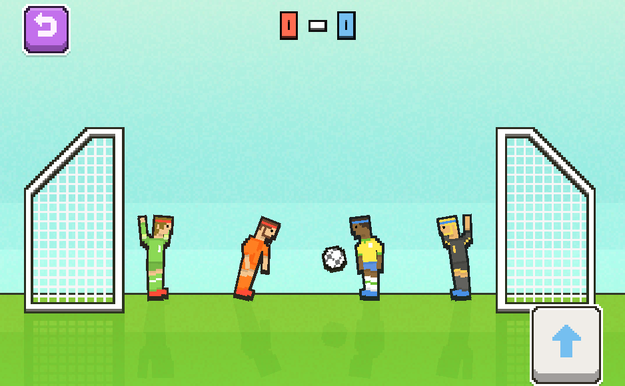 Soccer Physics is a strange game where you inexplicably control two soccer players with a single button, trying to score against the opposing team. It's an off the wall experience where the player is really left to wonder if he contributes at all the to the final outcome. Don't get me wrong. I enjoyed the game. I just thought it seemed a little arbitrary. I didn't really see any rhyme or reason to how my button clicking actually influenced the game. My team members were bob and kick when I pressed the button, but that motion seemed to change every time and I have discernible way to control whether they were moved forward or backward. The game itself the first team to 5 goals, which tends to go rather quickly. With such a low amount of control, the game was mostly comprised of "button mash until one side accidentally scores". And there's a big emphasis on "accidentally" because I think at least a third of all the goals I saw scored during my playing was done on their own goal, and that happened to me and my AI opponent equally. And that's about it. There is a local gameplay function, but that does little to alter the game. Instead of mashing a button against an AI, you're sitting next to another physical person who's also mashing a button and hoping for the best. It still feels very random and I still got very little out of it. Now, the animations are pretty funny, and it's good for a little bit of brainless fun. If you read my ryview about those 2 idle games, you know I don't need logic to like games sometimes. But this isn't zany enough to keep me coming back. It's quirky, but it's only skin deep, and after about 2 games I was ready to be done. I would be able to tolerate the single pointless button gameplay better if there were more modes, more stages, anything! As it is right now, there's nothing to keep me interested.